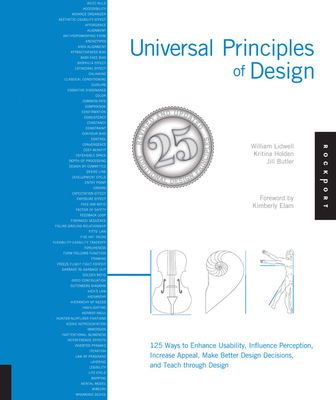 Universal Principles of Design, Revised and Updated is a comprehensive, cross-disciplinary encyclopedia covering 125 laws, guidelines, human biases, and general considerations important to successful design. Richly illustrated and easy to navigate, it pairs clear explanations of every design concept with visual examples of the ideas applied in practice. From the 80/20 Rule to the Weakest Link, every major design concept is defined and illustrated. Whether a marketing campaign or a museum exhibit, a video game or a complex control system, the design we see is the culmination of many concepts and practices brought together from a variety of disciplines. Because no one can be an expert on everything, designers have always had to scramble to find the information and know-how required to make a design work—until now. The book is organized alphabetically so that principles can be easily and quickly referenced by name. For those interested in addressing a specific problem of design, the principles havealso been indexed by questions commonly confronting designers (How can I help people learn from my design? How can I enhance the usability of a design? How can I make better design decisions? ...). Each principle is presented in a two-page format. The left-hand page contains a succinct definition, a full description of the principle, examples of its use, and guidelines for use. Side notes appear to the right of the text, and provide elaborations and references. The right-hand page contains visual examples and related graphics to support a deeper understanding of the principle. This landmark reference is the standard for designers, engineers, architects, and students who seek to broaden and improve their design expertise. William Lidwell is the Director of Design at Stuff Creators Design in Houston, Texas. He is author of the best-selling design book, Universal Principles of Design, which has been translated into 12+ languages, and Deconstructing Product Design, a social deconstruction of 100 classic products. He is the lecturer of two video series on design: "How Colors Affect You: What Science Reveals" available from The Great Courses, and "The Science of Logo Design," available from Lynda.com. Kritina Holden is a Human Factors specialist at Lockheed Martin–Space Operations and NASA, where she is responsible for performing applied research on HCI topics for the space environment. Formerly a Lead Usability Engineer with BMC Software, Kritina is author of numerous guideline texts in the areas of human-computer interaction and human performance. Jill Butler is the founder and president of Stuff Creators Design Studio. She and her staff help clients explain concepts and express themselves through graphics, interaction design, web site design, printed products, and custom-designed 3-D objects. She has worked as a print designer, information designer, and multimedia designer for herself and various companies in the Houston area. Jill served as a lecturer and taught design-related classes at the University of Houston and Kingwood Community College.